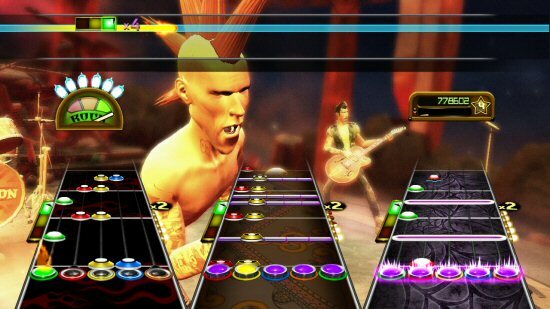 Guitar Hero Greatest Hits is the latest addition to the ever popular Guitar Hero rhythm-action series. This latest entry brings together some of the better tracks from Guitar Hero, Guitar Hero II, Guitar Hero Encore: Rocks the 80 and Guitar Hero III: Legends of Rock. This isn’t, however, just a standard compilation pack. Guitar Hero Greatest Hits incorporates all of the features from Guitar Hero World Tour which, if you don’t know already, added drum and microphone support in addition to the rudimentary bass and lead guitar parts. With all the new features from Guitar Hero World Tour present, you can take advantage of the offline Band career mode, as well as 8-player online Battle of the Band that allows two full bands to complete head-to-head. Furthermore, you can now utilise the Music Studio GHTunes and the Rock Star Create mode that appeared in the last game in the series. Once again, Guitar Hero Greatest Hits gives you the opportunity to release your inner Rock god by jamming along to some top class tunes without having ever having to pick up and learn a real musical instrument.